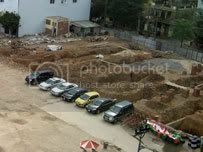 21 March 2007 (Thanh Nien News) – A Ly dynasty imperial altar was discovered while laying the foundations for a new supermarket. Fortunately, the supermarket project has been shelved and site is to be investigated by archaeologists. Vietnamese archeologists will begin excavation in Hanoi Friday for the first imperial altar to the gods that experts believe was built in the 12th century by the Ly dynasty.